Rockstar Arizona Cheer, Tumbling & Dance, formerly Fyrestorm All-Star Cheer, is set to celebrate their new name and expansion at 10 am on August 12th in Suite C of the Mesquite Building at Santa Cruz Commerce Center. Ak-Chin Indian Community Chair Robert Miguel and Mayor Christian Price will be on hand to share congratulations with owner, Beth Mundell, and to assist with the ribbon-cutting. Prior to the ribbon-cutting, Rockstar Arizona will offer a free public tumbling clinic from 9-10 am. Following the ribbon-cutting, championship cheerleader and coach known for competing at the Cheerleading Worlds and Nfinity Legends, Rockstar Beatles Kennedy Thames, and Beatles Head Coach Scott Foster, will also be available for a meet and greet. Rockstar Arizona’s programming encompasses co-ed, all-star, competitive, and recreational cheer and tumble for children 1 to 18 years old, as well as, classes for adults and those with special needs. Cheer programming involves dance, jumping, acrobatics, stunt-building and tumbling, which can showcase solos, duos, group stunt and partner stunt. Rockstar all-star teams have divisions for tiny, mini, youth, junior, and senior levels 1-5. In addition, there is an all-star hip hop program, which features teams and individuals. In addition, the program emphasizes character-building and self-confidence. “We want our athletes to be around good role models that will make them good human beings,” said Mundell. Since its opening, the program has grown from an enrollment of about 65 to 100 athletes and from six to 21 staff members who include a number of specialists. “We coach a little differently,” Mundell said. “Rather than having coaches that generalize in a lot of areas. We have co-ed specialists, dance specialists, tumbling specialists, etcetera. We focus on family and that’s why we’re about half as expensive as other gyms.” In her new expanded space in Suite C of the Mesquite Building, Mundell expects to accommodate up to 200 athletes. To find out more about Rockstar Arizona’s classes and programs, visit rockstararizona.com or call 856-624-3375. Four years ago, Fyrestorm All-Star Cheer was just a dream of tumbling and cheer coach, Beth Mundell. 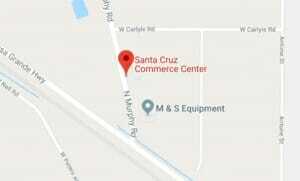 But with an assist from the Ak-Chin Industrial Park Board, Mundell was able to make her dream a reality when she opened her business in August 2013 in Suite E of the Mesquite Building at Ak-Chin’s Santa Cruz Commerce Center. Now Mundell is cheering her gym’s expansion under a new name: Rockstar Arizona. The Fyrestorm program quickly gained prominence and for the last two years in a row, Fyrestorm athletes were invited to compete at The Summit – All Star Cheerleading Championship, which according to Mundell “is like the Super Bowl of cheer.” Now to further promote Mundell’s gym as the only local, Maricopa-based USASF-credentialed cheer and tumbling program with USASF and USAG-credentialed coaches, Mundell agreed to license the Rockstar Cheer & Dance name since it is recognized in cheer circles across the nation. “We are still an independently owned and operated family business,” Mundell emphasized. Rockstar Arizona’s programming encompasses co-ed, all-star, competitive, and recreational cheer and tumble for children 1 to 18 years old, as well as, classes for adults and those with special needs. Cheer programming involves dance, jumping, acrobatics, stunt-building and tumbling, which can showcase solos, duos, group stunt and partner stunt. Rockstar all-star teams have divisions for tiny, mini, youth, junior, and senior levels 1-5. In addition, there is an all-star hip-hop program, which features teams and individuals. In addition, the program emphasizes character-building and self-confidence. “We want our athletes to be around good role models that will make them good human beings,” said Mundell. To find out more about Rockstar Arizona’s classes and programs, visit rockstararizona.com or call 856-624-3375. Watch for their Grand Re-Opening announcement, coming soon! Commerce Center Welcomes Arp Custom Farming, LLC. The Ak-Chin Industrial Park Board is pleased to welcome Arp Custom Farming to Suite D of the Mesquite Building in the Santa Cruz Commerce Center. Owned by Gator and Ashley Arp, Arp Custom Farming uses the latest technology to provide innovative planting, tillage and harvesting services for local farmers in the western Pinal County area. A fourth generation farmer and grandson of early Maricopa leaders, Sonny and Dode Dunn, Gator grew up in the family business in Maricopa. Now he uses non-conventional methods in his farming services to maximize efficiency and yield. To find out more about the services of Arp Custom Farming, call 480-802-1551.
https://leaseakchin.com/wp-content/uploads/2017/04/Picture-Gator-cropweb2.jpg 812 1239 robin https://leaseakchin.com/wp-content/uploads/2016/06/SCCC_logo_RGB_214x120.jpg robin2017-04-21 12:34:032017-04-21 12:35:53Commerce Center Welcomes Arp Custom Farming, LLC. Do you live in Casa Grande and have discovered that both High Grade and Horizon Tool Rentals & Sales have closed? Good thing that our tenant, Tillers Equipment & Tool Rental & Sales, is just a short jaunt down the Maricopa-Casa Grande Highway to the Mesquite Building in the Santa Cruz Commerce Center. Tillers is a family-owned business that not only serves the city of Maricopa, but also the city of Casa Grande and surrounding municipalities by providing some of the lowest prices in tool rentals, tool sales, and tool repairs. You’ll find leading brands of outdoor and indoor power equipment including air compressors and air tools, lawn mowers, line trimmers, edgers, generators, garden equipment, pressure washers, ladders, edgers, drills, and more for both commercial and residential needs–all clean, inspected and ready to go before you pick it up. Ask if your area qualifies for Tillers free equipment pickup and delivery. Tillers also has a full line of Penske trucks available for lease. Call 520-568-2009 for more information or to make your reservation today.